All information for a coverage relationship is stored in a single runnable file : the coverage file (*.cover). This option has not effect if END TEXT tag is used. If END TEXT is empty: If the option is checked, the statement text is read until the end of the first paragraph. This limits the length of the extracted text. If the option is unchecked, all paragraphs are read until the next new section (new heading, new sheet) or the next tag. This option has not effect if END TEXT tag is empty. If the option is checked, the statement text is read until the next section (new heading, new sheet) or until the next tag. If the option is unchecked, all sections are read until the END TEXT tag is found, or another tag is found. Complex feature for advanced user only - This option enables the advanced regular expression for the statement, see Syntax examples. This kind of expression are very complex and shall not be used for beginners. Selects if the title is on the same line as the REQUIREMENT ID, or in the next line. Uncheck this box if your requirement do not have a title. If checked, requirement will have a title that is read just after ID. If unchecked, the ID is followed by text or by custom tags. If the option is checked, the version can be a free text with digits 0-9, letters a-zA-Z, dashes -, dots . and spaces . This section lists all available controls. The icon is green when the control is enabled, else gray. See Control Engine. 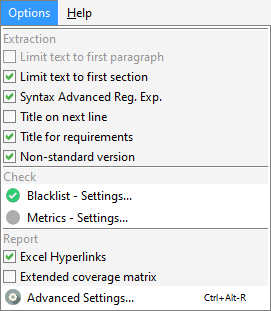 If enabled, includes hyper-links to source documents in the EXCEL reports. These information are always included in the Status tab of Coverage Matrix. This menu opens the on-line help. This menu opens the support Web page. It is enabled for if the maintenance service is active.